The Roller Hearth Kilns offers the manufacturer a fuel efficient solution where cycles are fast and products require a very tight temperature uniformity. 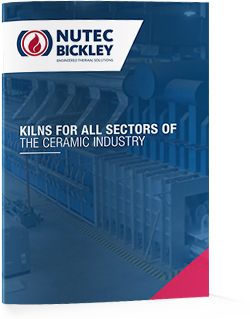 For special technical applications, Nutec Bickley have provided roller hearth kilns as an alternative to shuttle or tunnel kilns. Ceramics rollers are supplied in different materials (mullite or silicon carbide) depending on the application requirements.If you need further assistance with your Roller Hearth Kilns you can contact us! Energy recovery systems to ensure the lowest fuel consumption. Energy Recovery System: Pre-heated combustion air up to 425°C (800°F) or self-recuperative burners with pre-heated air up to 700°C (1,300°F).